It’s Saturday again! And you know that means another Create with Connie and Mary Saturday Blog Hop. Our theme this week is hippity hoppity Easter favor. For some reason whenever I think of an Easter favor I think the old standby – Sour Cream Container! Picture Perfect Party dsp (Lemon Lime Twist print) – 1 3/4 x 3 1/4, cut into a banner, punch 1/4 hole through top of tag and top of sour cream contain and add Bermuda Bay Mini Chevron Ribbon to attach tag to container. Are you ready for Thanksgiving? Can you believe it is only 3 days away! We had our Brown family Thanksgiving yesterday…absolutely crazy! I had to bring a side and decided to do a corn casserole that I could make in the crock pot. Found a nice easy recipe on Pinterest of course! For actual Thanksgiving day, we are having lasagna! LOL!! I have enjoyed using using my Gourd Goodness set and decided to use it with the yummy Painted Autumn dsp. Happy Tuesday! Can you believe it’s the last Tuesday in September! WOW…October starts on Sunday! This week the theme for the SUO challenge is Shape Up! Favorite Punch or Die. Well…there are just WAAAAY too many from which to choose. So, since I just cleaned my stamping area, I went with my method of “use what it on top of my desk”. Well I happened to have 4 punched out cats and a strip of Silver Glimmer. What can I say…it basically made itself. See how super easy that was! I LOVE easy! Happy Fall everyone! WOW…I can’t believe it is already September and even better…the Holiday Mini is LIVE! Since the mini is LIVE we thought it would be a great time for the design team to use their Favorite Holiday Mini Item. Now that is tough one and I decided to go with my Favorite Holiday Mini Item right now! That would have to be the CAT Punch! Now before I get into any details I have to tell you…this is a BIG card! The finished size is 4 1/4 x 8 1/2! I REALLY wanted to do 3 cards and I really wanted to do 3 frames and well, this was the size the worked! LOL!!! Wanting more ideas from the Holiday Mini…well we have that for you! The Create with Connie and Mary September Mini Edition opens in just a couple of days. It’s true! And the design had so much fun using products from the new Holiday Mini! Head over to Create with Connie and Mary to subscribe today! Happy April everyone and happy April Fools Day! Don’t worry though…we don’t are going to play any tricks on you with our hop. Instead the design team has been busy creating Easter favors! So…nothing says ‘Easter Favor’ to me like an Easter Basket and the Window Box Thinlit was just made for this! And it is SOOOOO EASY! Crumb Cake – cut out ONE of the window box pieces, cut the top piece in half (to make the back panel) and then run through again to add the slits, put together. WOOO HOOO!!! 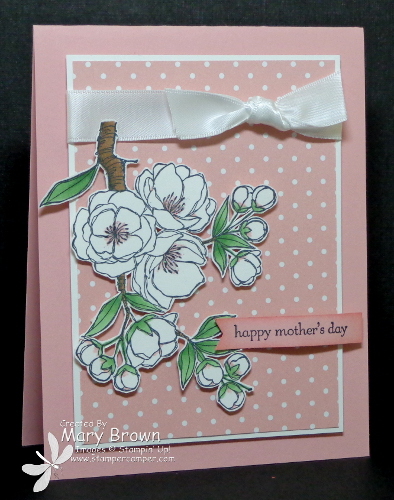 It’s time for another SUO challenge and the theme this time is Mother’s Day card. Although I no longer need a mother’s day card, I decided to make this in a way that I change the greeting and use it for another occasions later. I was trolling around Pinterest and saw the flowers done in white with just a touch of pink in there and I thought that was just SOOO pretty! Yes..I cut out the entire image. Yes…I am NUTS!!! But it looks SOOO pretty this way! Blushing Bride dotted (Subtles DSP Paper Pack) – 3 3/8 x 4 5/8, layer on Whisper White 3 1/2 x 4 3/4. Tie White Silk Ribbon around card and add to card front using dimensionals. Stamp flower image using StazOn Jet Black. Color using Chocolate Chip, Wild Wasabi and Blushing bride. Cut out and add using dimensionals. Stamp greeting on Blushing Bride – 1/2 x 2, cut into a banner, sponge around edges using Blushing Bride, add to card front using dimensionals. Add dazzling details to centers of the 3 large flowers to finish it off. Don’t forget to check out what the rest of the design team to see they did with this challenge! HAPPY NEW YEAR!!! I have to see I am SOOOO glad that 2014 is OVER! Here’s to MUCH better 2015! Since it is Thursday it is time for another Create with Connie and Mary Thursday Challenge. 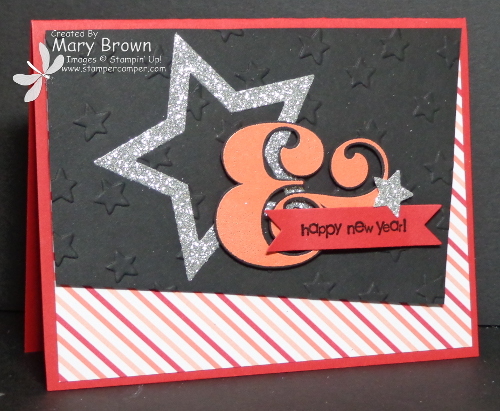 Since I’ve been using the You Plus Me for the Create with with Connie and Mary Valentine Mini Collection and I just LOVE the ampersand in there, I thought I’d use that for a new year’s day card! Basic Black – 5 x 3 1/2, lay it on top of the striped piece on a diagonal and trim. Add diagonal print to card front. Run black piece through the Lucky Stars embossing folder and add to card front using dimensionals. Silver glimmer – cut out star frame using layered Star Framelits and add to black piece. Stamp ampersand on Basic Black using Versamark and emboss using Calypso Coral embossing powder, cut out and add using dimensionals. Stamp greeting using black on Real Red and cut out using Bitty Banner. Add to card front using dimensionals. Punch out Silver Glimmer start using punch in Itty Bitty Accents Punch Pack. Add using dimsneioanls to finish off.